Bivalves belong to the invertebrate phylum Mollusca, which also includes snails, squids, and octopuses. Some well-known bivalves include clams, scallops, mussels, and oysters. More than 15,000 species of bivalves exist. All bivalves are aquatic, encompassing both marine and fresh-water species. Giant clams can weigh more than 227 kilograms (500 pounds), and are the largest bivalve mollusk in the world. These giant clams are at a fisheries research center on Micronesia's Koror Island. The name "bivalve" refers to the two-part shell that characterizes these mollusk species. The two halves of the shell are joined by a ligamentous hinge and held shut by a pair of strong adductor muscles. The shell is made of calcium carbonate and is secreted by the mantle (soft body wall). Shells grow with the organisms, extending out from the hinge area. Most bivalve species go through a free-swimming larval stage before taking on their characteristic adult form and lifestyle. Most species of bivalves are filter feeders. Currents of water are drawn into the body and through the gills, where tiny food particles are caught in the gill mucus. This flow of water also functions in respiration, allowing organisms to obtain fresh oxygen. A few bivalve species are predatory, including some deep-sea scallops. Bivalves make use of a variety of lifestyles. Sedentary species (e.g., mussels and oysters) spend their lives attached to a substrate , whereas others burrow underground (e.g., clams) or live on the water bottom and swim (e.g., scallops). Bivalves have highly reduced heads and simple nervous and sensory systems. Most species have some chemosensory cells at the edge of the mantle that are used to detect chemical signals in the water. Some also have simple eyes. Bivalves have an open circulatory system. A number of bivalve species have some commercial value, including representatives of all the groups discussed here. Bivalves are valued as food sources, and throughout history their shells have been used for many purposes. Most buttons were made from shells before the advent of plastic. In addition, shell fragments have been used for everything from roads to fertilizer. Finally, the beautiful pearls found in oysters have always been treasured. 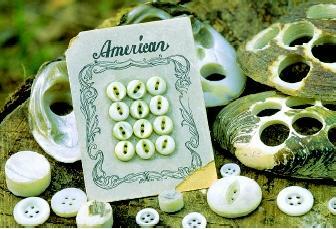 In the late 1800s and early 1900s, making buttons out of fresh-water mussel shells was a multi-million-dollar industry. This was common practice until the growth of the plastics industry in the 1940s and 1950s. At certain times, some mollusks can become toxic to animals and humans who consume them. Toxins produced by certain algae during a bloom (rapid population growth) bioaccumulate in the tissue of mollusks, and then may be ingested by higher-level consumers who eat the mollusks. Clams live underground, using a muscular foot to dig down into sand or mud. They take in water for filter feeding and gas exchange through an extended part of the body called the siphon, or neck. The siphon is also used to disperse eggs or sperm. In some species, such as the geoduck clam, the siphon is extremely long, allowing the clam to remain safe deep underground. The geoduck is the world's largest burrowing clam, and can live up to 145 years. Common predators of clams include starfish and eels. Defensive behavior involves retracting the body and closing the shell as tightly as possible. The giant clam can grow to lengths of 1.2 meters (4 feet) and is unusual in that it harbors algae (e.g., dinoflagellates) within its tissues. The algae obtain shelter and protection from their host, while the clam obtains important nutrients that are products of algal photosynthesis . Scallops are unusual among bivalves in that they are capable of jet-propelled swimming. Sudden contraction of the adductor muscles quickly closes the shell, causing water to be ejected on either side of the hinge. Scallops thus swim in short spurts. Scallops generally live on sand bottoms. They may attach themselves to rocks but are able to detach and swim to a new location. Jet propulsion also is used as an escape response to avoid potential predators, such as starfish, snails, and fish. The large, well-developed adductor muscles represent the edible part of the scallop. Scallops are also unusual among bivalves in that their eyes are well developed. They have a series of eyes around the edge of the shell that are critical in helping to detect predators. The importance of eyes is likely related to scallops' unique locomotor capabilities among bivalves. Scallops often occur in dense congregations known as scallop beds. These are sometimes temporary, but permanent beds do occur in areas with optimal temperature conditions and food availability. Commercial fishing of scallops has diminished many natural populations, and the use of scallop farms has helped meet consumer demand. Mussels are sedentary bivalves. They attach themselves to a firm substrate using secreted threads known as byssal threads, which are produced by the byssal organ of the muscular foot. Mussels frequently occur in large colonies, forming mussel beds. Like other bivalves, they are filter feeders. Fresh-water species of mussels occur in streams and rivers. Unlike marine bivalve larvae, which are free-swimming, the larvae of fresh-water mussels are parasitic , most often on fish. Numerous species of fresh-water mussels are endangered, including roughly half the species that occur in North America. The zebra mussel is an invasive fresh-water species that was accidentally introduced into North America in the 1980s from its original European habitat. It spread quickly through eastern North America. The zebra mussel continues to have a detrimental impact on water supplies by clogging intake pipes and other structures, and much effort continues to go into controlling its spread. Zebra mussels can be spread to new waterbodies by fishing activities and by boats, to which they often attach. Oysters are sessile (nonmotile) bivalves that live attached to substrates such as rocks. Like many other bivalves, they occur in beds and are filter feeders. Oyster shells tend to be rough on the outside but smooth on the inside. Oysters are sequential hermaphrodites: that is, they are spermproducing males when young and then become female egg producers when older. The largest oysters reach sizes of up to about 38 centimeters (15 inches). Oysters grows continually throughout life and may live as long as 100 years. Several species of oysters are valued as delicacies, and some are cultivated for food. However, oysters are perhaps best known for their pearls. (All bivalves make pearls, but those of oysters are particularly valued.) 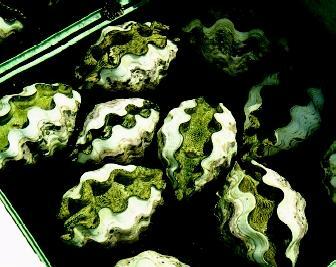 When small irritants become lodged within the shell, the oyster deposits layers of pearly material around the irritant. This material is identical to that used to line the inside of the oyster's shell. SEE ALSO Algal Blooms, Harmful ; Cephalopods ; Great Lakes ; Mariculture ; Pollution by Invasive Species . Brusca, Richard C., and Gary J. Brusca. Invertebrates. Sunderland, MA: Sinauer Associates, 1990. Gould, James L., and William T. Keeton, with Carol Grant Gould. Biological Science, 6th ed. New York: W. W. Norton & Co., 1996. Hickman, Cleveland P., Larry S. Roberts, and Allan Larson. Animal Diversity. Dubuque, IA: Wm. C. Brown, 1994. This is a good source. You can learn lots of information about it. Does this mean that if I grab a few pounds of zebra mussels out of the rivers, I could possibly find a few teenie tiny pearls in the bunch?